The egg is just between 72 to 85 calories but provides us with about 7 grams of protein, B vitamins, iron, zinc and is loaded with amino acids, antioxidants as well. This solid diet staple is not good stuff alone. Keep in mind before you crack an egg, it already has 2 grams of saturated fat and 212 milligrams of cholesterol. That doesn’t mean you have to throw it away. What you need is to learn harmless ways to cook eggs. Eggs can be part of a healthy diet even though they’re high in saturated fat and cholesterol. Moderation and smart cooking can help to make eggs a healthy part of your diet. But, is there an optimal way to cook an egg? 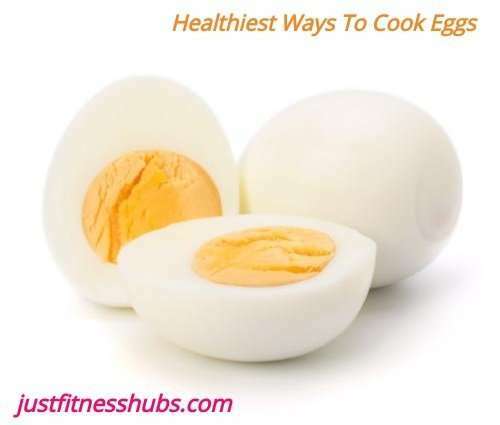 In this article you will find most nutritious and healthy ways to cook and eat eggs without adding extra fat and calories. Next time you go to reach for an egg, keep these healthy eggs cooking tips in mind. (i) Boiled: Boiling is an easy way to cook your eggs without adding any extra saturated fat. Boiling an egg keeps the yolk intact, containing all the nutrients in one stable location. One large, hard-boiled egg has 5.3 grams of fat, 7 grams of protein, 186 milligrams of cholesterol and 78 calories. Try a hard-boiled egg as a simple breakfast with 100-percent whole-grain toast, or cut it up and put it on a salad for added protein. You can also use them as ingredients in recipes for dishes such as egg salad. Look for recipes that go easy on fat and include other nutritious ingredients. Tip: If you’re watching your cholesterol, take the yoke out. That way all the cholesterol will be removed. (ii) Poached: Poach eggs by simmering them in water (not in boiling water) after removing them from the shell. It’s one of the healthiest methods as you’re just cooking them in water without adding fat. Poached eggs have the same nutritional value as hard-boiled eggs. Serve the eggs over 100-percent whole-grain toast or on top of cooked green vegetables, such as asparagus, to add more vitamins, minerals and fiber to your egg dish. (iii) Baked: And if you are looking for another low fat cooking option for eggs, try baking. (iv) Scrambled: Scrambled eggs recipes can be some of the least beneficial because they often call for milk, extra butter, cream etc. So you’re not only getting the calories from the eggs – which are fine – but you’re getting extra fats also. But if you use water instead, your scrambled egg will have the same fat, cholesterol and calorie counts as hard-boiled eggs. Alternatively, separate the yolk and use only the egg whites. One scrambled egg white has 17 calories, 3.6 grams of protein and almost no fat. Boost the nutritional value of scrambled eggs by adding chopped peppers, onions, mushrooms and spinach. Useful Related Post: How Much Fat An Older Adult Needs? (v) Fried: Frying an egg needs the most heat, which affects potential nutritional value of the egg. A large egg fried in butter or margarine has more calories and fat. You can avoid this unwanted fat, by using an oil spray or a nonstick pan. Serve fried eggs with 100-percent whole-grain toast or with cooked vegetables and potatoes. Steer clear of creamy sauces and cheese topping for your eggs. Eggs are great option for seniors. It’s just about being careful about the extra ingredients. As for the eggs themselves, they contain 11 essential vitamins and minerals. They are really unbeatable. They’re high in protein and vitamin B12, high in monounsaturated fats, phosphorus that is vital for bone health, iodine for healthy thyroid function, folate and vitamin A as well. They’re also naturally low on salt and sugar. Useful Related Post: How An Older Adult Can Meet His Or Her Protein Needs? Salt is another thing, which the older adults should be mindful of. It’s likely to affect your blood pressure, so be carful while adding salt to your egg preparation. When choosing your cooking media, be natural and use olive oil and avoid butter.